In August, Stratford-upon-Avon is an ants nest of tourists. They swarm through town drawn (as we were) by advertising that emphasises the mystique of Stratford-upon-Avon as Shakespeare’s birth place. Actually, Stratford doesn’t need the help of advertising. It is genuinely and attractively exotic, especially thanks to its architecture. Shakespeare’s reputation has thrown a protective cover over its historic buildings – buildings that in any other town would have succumbed to shifts of fashion or been erased by developers. 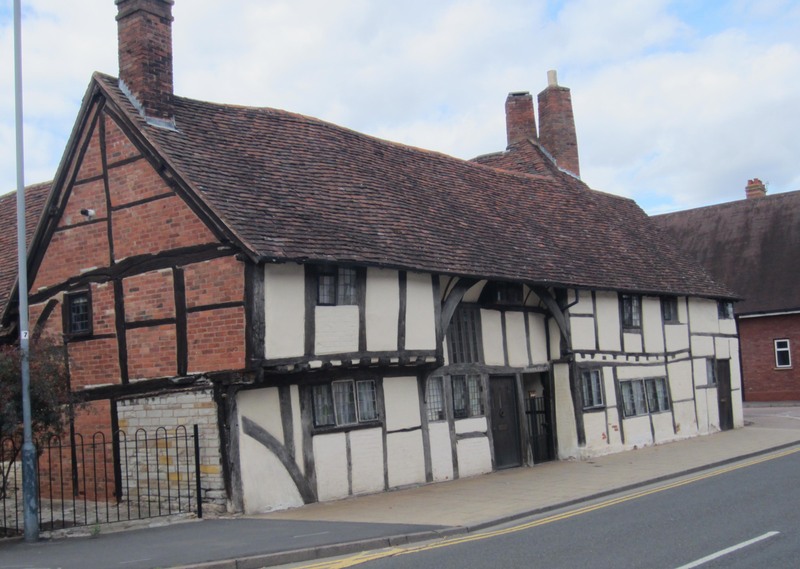 A bit warped by the passage of 500 years, a mostly wooden Tudor house still stands in a Stratford street. The many Tudor houses that stand warped and wonky across the centre of town are especially fascinating. Most were built around a frame of rough-hewn, time-darkened oak beams. The spaces between beams were filled with latticework made from woven switches of wattle and other woody plants, and this latticework was filled in with a daub made of clay and chopped straw. When the panels hardened they were coated with a whitewash that, in combination with the oak beams, gave Tudor houses their characteristic black and white appearance. Although the panels are hard, even today they still need to be replaced, repaired or re-coated regularly. The ground floor was layered with smooth flagstones and the houses were roofed with thick thatch. The Tudors did not have the technology to make large panes of glass so windows were assembled from small square panes held in place by lead and were protected from winter cold by wooden shutters. In Tudor times many houses did not have ceilings or chimneys. Smoke from domestic fires simply filtered out through the roof thatch. In the course of time chimneys and upper floors appeared, with bricks replacing the wattle and daub panels on the lower floors, and tiles replacing the thatch. Tudor-style houses have proved they can defy time. 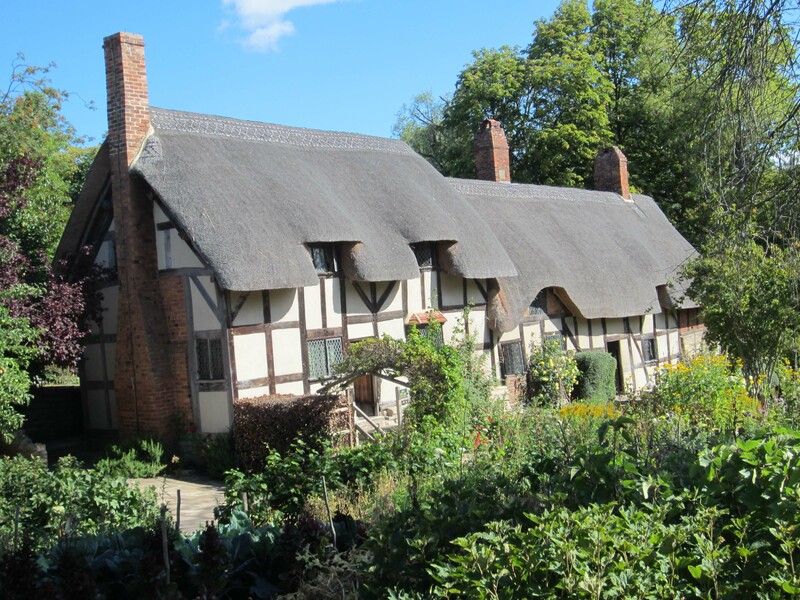 For more than a century the two-storey house where William Shakespeare was born in 1564 has been a tourist attraction. Today, thousands of visitors shuffle through it every day, yet the house appears to be as creakily solid as (presumably) it was when it was built over 500 years ago. Until late in the 19th century descendants of Shakespeare’s sister, Joan Hart, occupied the house, and today vestiges of its evolution over the centuries since the playwright’s death have been preserved. Although some of the rooms appear as they were in Shakepeare’s time the house is not 100% a reconstruction of some Tudor “original”. Additions and artefacts from later times, especially from the nineteenth century, can also be seen. It is good that the official guardians of heritage have resisted the temptation to strip away the normal accretions of time, and as a result the evolution of the house as a lived-in dwelling can be appreciated. 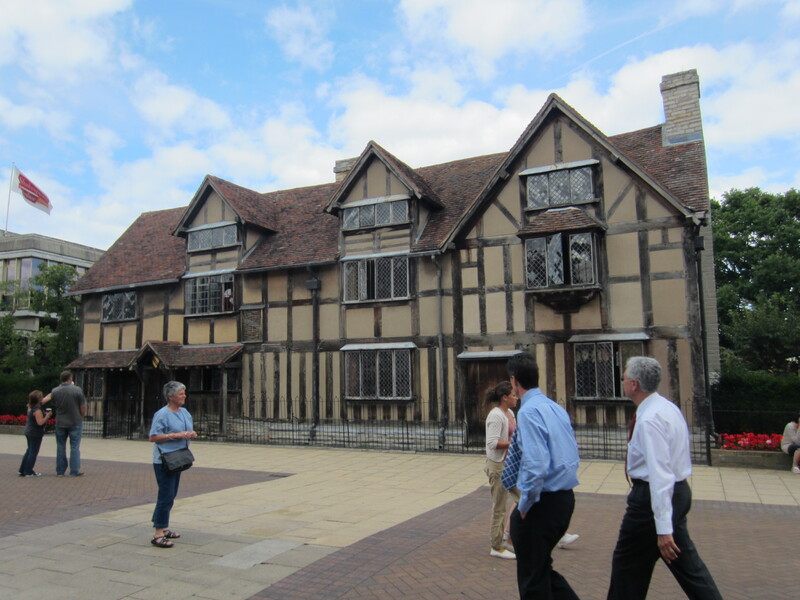 A few kilometres from the centre of town stands the house of Anne Hathaway, Shakespeare’s wife. It too is not exactly as it originally was, but it can nevertheless be enjoyed as a beautiful, surprisingly roomy house surrounded by a garden fragrant with the scent of sweet peas. This is the house that, in modern times, has come to represent the model Tudor house, an iconic embodiment of perfect Englishness. Ann Hathaway’s beautifully preserved house with its beautiful garden on the outskirts of Stratford-upon-Avon. The tourist industry tends to seize on one or two key features of a person, place or event and invest them with mythic authority, transforming them into simple, saleable tags that are easily advertised and stand for something far more complex. So we found that William Wordsworth is daffodils, and Jane Austen (we visited the Jane Austen Centre in Bath) is the handsome but dopey Mr Darcy. 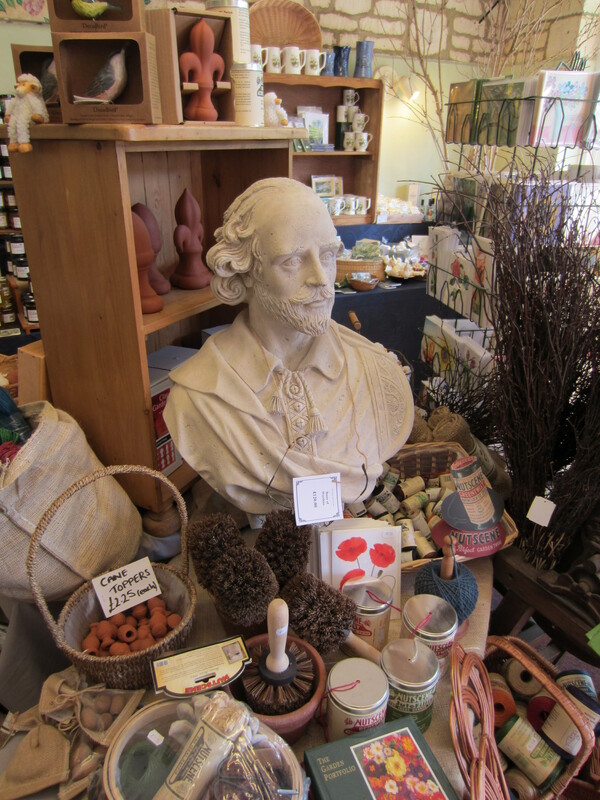 The gift shops of Stratford are filled with Shakespearean neck ruffs, sonnets and insults. On tee-shirts, in plaster busts of various sizes, and in fridge magnets you have the balding guy with a goatee beard and a lace ruff around his neck. You also have “The Sonnets” on tea towels and in sugary special editions many of which highlight iconic snippets (“Shall I compare thee to a summer’s day?” “Let me not to the marriage of true minds…”). And you have desk calendars and coffee mugs that quote Shakespeare insults (“Thou clay-brained guts, thou knotty-pated fool, thou whoreson obscene greasy tallow-catch!”). Give your wife or girlfriend a little bit of yourself to put on her lips. 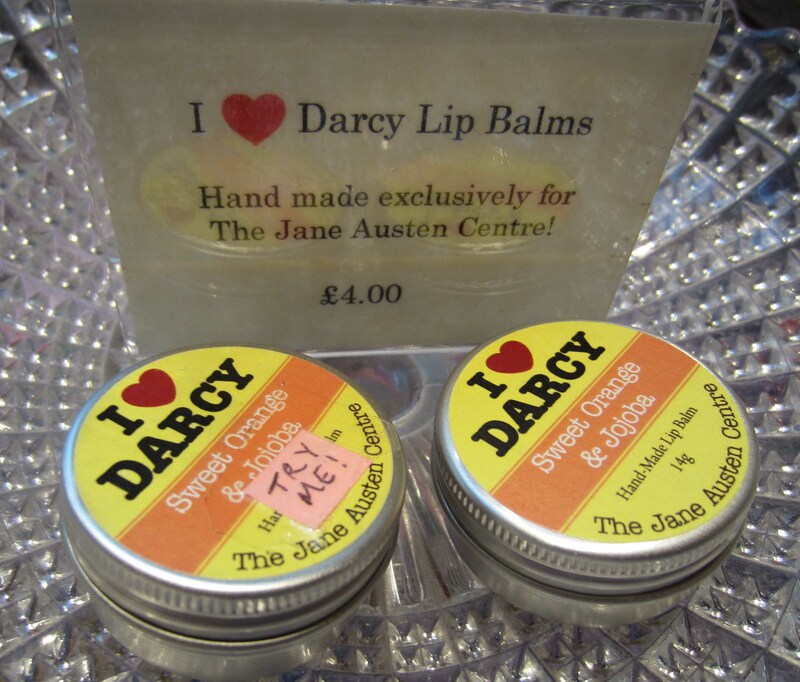 Mr Darcy lip balm on sale at the Jane Austen Centre in Bath. How do you know which wash room is for gentlemen at the Jane Austen Centre in Bath? 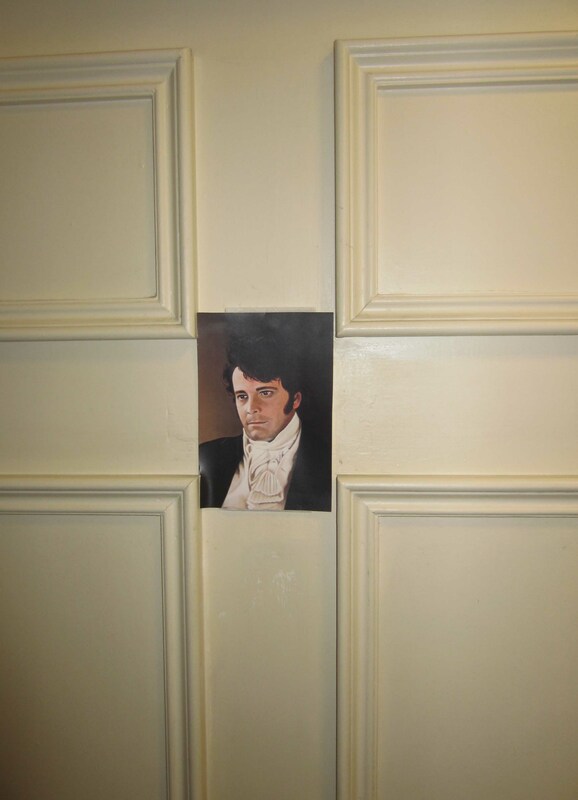 Why the one with a picture of the smouldering Mr Darcy (you) on it, of course. So, like the religious devotees of former times, today you can buy your own mass-produced but much degraded relic of a super-human figure. But it was gratifying to discover that Shakespeare’s complexity and subtlety have proved difficult to reduce. No single motif dominates. And while it is easy to speak disparagingly of all this commercial dross, I have an uneasy feeling that, if he were alive today, Shakespeare himself might be delighted at his sales profile. He was, after all, a theatrical entrepreneur, a businessman in pursuit of profit. 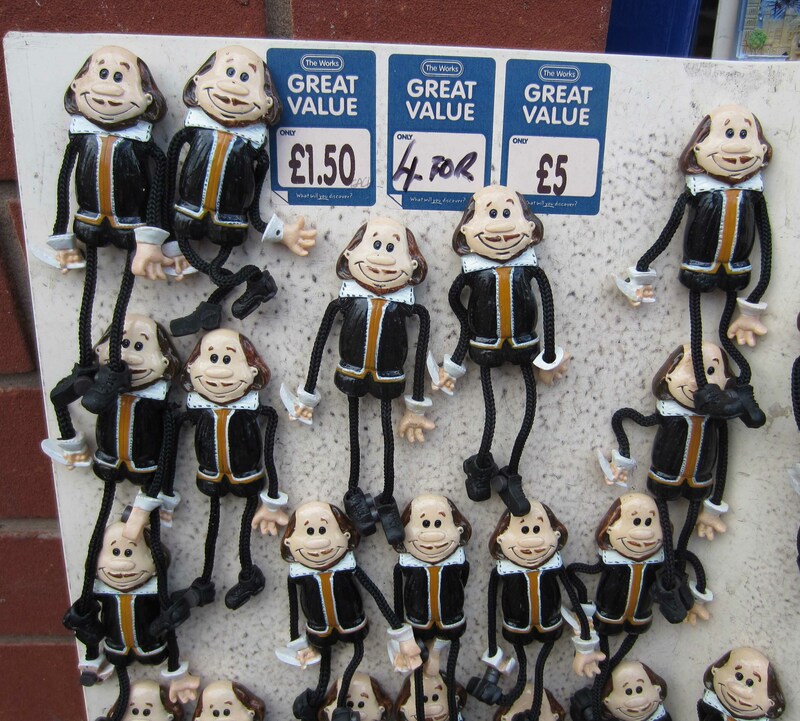 Four Shakespeare mini-dolls for just five pounds? That’s value! 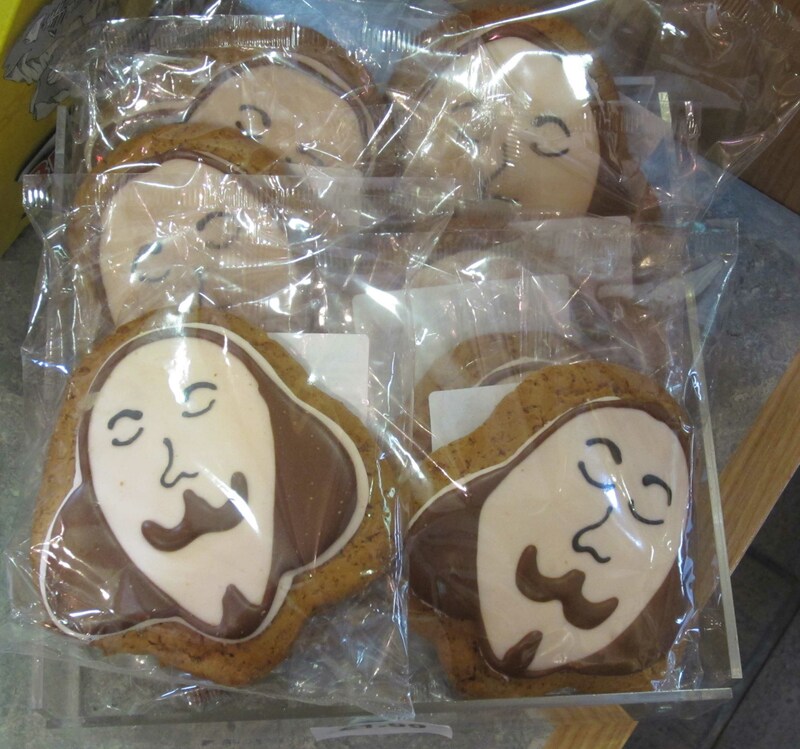 As you stroll the streets of Stratford-upon-Avon you can munch on Shakespeare gingerbread. They’re yummy. On the night of August 16th – close to the traditional time of mid-summer – Emmy and I headed for the brand-new Royal Shakespeare Company theatre for a long anticipated performance of A Midsummer Night’s Dream. The new theatre is a modern incarnation of Shakespeare’s Globe in London where, a month before, we had seen Hamlet. Like The Globe, it is “theatre in the round”. It has no proscenium arch framing a “window-on-the-world” stage that appears when the curtain rises. Rather, the stage juts into the audience and the upper galleries of seating look down directly on to it. We sat in the stalls almost close enough to reach out and touch the actors. In the middle of the stage stood a pudgy modern sofa, and to one side a café table with wooden chairs around it. As the audience took their seats, the actors also strolled one by one onto the stage. They were wearing modern clothes. One actress was even wearing spangled hot pants. They stood in small groups chatting and drinking from wine glasses. Suddenly the lights went out. A group of actors appeared, indistinct in the dimness but wearing what appeared to be miners’ overalls and carrying flashlights. One of them lifted a trapdoor in the centre of the stage and, jostling against one another with flashlight beams criss-crossing around them, they disappeared underground pulling the trapdoor shut behind them. My heart sank. I have always disliked productions of plays from distant times that are presented in modern settings. The themes of these old plays are invariably relevant – sometimes shockingly relevant – to modern times, but there is a distracting, jarring disconnect between the modern milieu and costumes, and the pre-modern language of the play. The modern setting seems gimmicky and lazy. But I needn’t have worried. On this night we were in good hands. I was about to be taught a lesson in theatrical craftsmanship. As Shakespeare intended, we were in a dream world and the action moved easily between different dreams. The overalls and hot pants, the over-stuffed sofa and long-stemmed wine glasses, all the consumer goods and the elegant style icons of contemporary life were as insubstantial, ephemeral and downright weird as the play’s forest fairies and Athenean aristocrats. What really surprised me (having never seen – or even read – A Midsummer Night’s Dream before) was the belly-laugh humour of the play. It was a slapstick riot, but it was also a smorgasbord of jokes that seemed undimmed by their archaic language. Quince in a horse-trainer’s cloth cap, Bottom in high-heel workers boots, Puck in a trim jacket and tie: somehow it seemed to work. Even when the actors were weaving among dozens of kitchen chairs suspended from ropes just above the stage floor I put aside my instinctive resistance to avant-garde obscurity and had a good laugh, along with the rest of the audience. During the intermission Emmy and I sauntered on to the terrace outside the theatre. The sun had set but the sky was filled with muted light and the air was warm. To our right the River Avon, now empty of tourist boats but still dotted with ducks and swans, flowed quietly under its medieval stone bridge. To our left stood the compact centre of Stratford stamped here and there with the black and white imprint of Tudor houses. Incredibly, in the park between town and river a group of men happened to be rehearsing a morris dance. With jingling anklets they zig-zagged amongst one another lifting their knees high and flapping their handkerchiefs to the accompaniment of music from a tape player. The idyllic River Avon. On its banks there is an ugly reality that refuses to go away. Not far from them, directly in front of us in the park, a more sinister scene was being played out. A group of six or eight young people, all drunk, stood pushing at each other and arguing in shrill voices. A girl with spiky blond hair wearing torn black stockings below a mini-skirt screeched and shoved at a teenage boy. The boy’s hair had been shorn from one side of his head but left hanging in dreadlocks on the other, and he kept tugging at his greasy jeans loosely strapped low around his thighs. Suddenly the boy turned towards the theatre terrace and raised his middle finger in our direction. With his other hand he raised a bottle of booze and shook it over himself. Earlier in the day I had read a disturbing newspaper report about a young single mother of two who lived in Stratford-upon-Avon. To help make ends meet she had taken in a lodger, another young woman with whom she was on friendly terms. The second woman had gone to Birmingham when rioting broke out there on August 8th and had returned to her lodgings in Stratford-upon-Avon with a small quantity of looted clothing. She gave a pair of stolen shorts to her “landlady” friend who had been asleep at home with her children when the looting took place. The police arrested the young landlady and charged her with receiving stolen goods. The court hearing was swift. Within days the shocked woman had been convicted and sentenced to five months imprisonment. 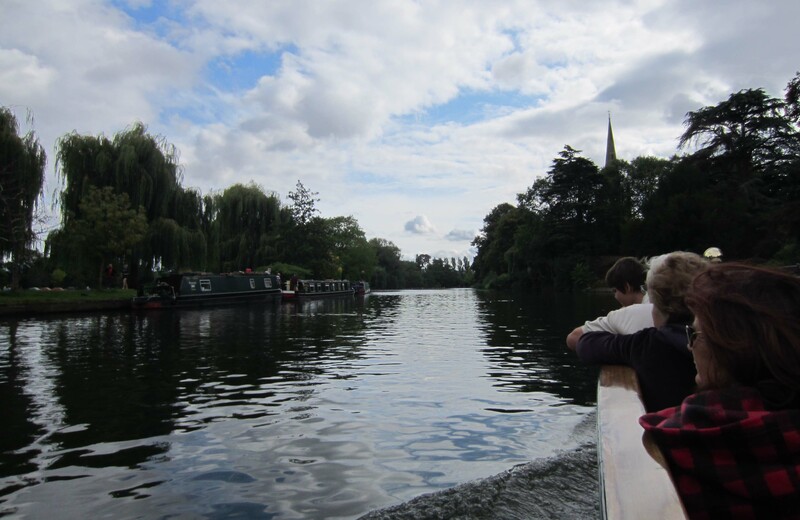 Behind the idyll of Stratford-upon-Avon there is a hidden world of deprivation and frustration. It is a world that, when it comes to the attention of England’s elite (which doesn’t happen often), is judged in purely moral terms and dealt with harshly. In the 19th century you could be transported to the penal colonies for stealing a loaf of bread. Today you can be dumped in jail for five months for receiving a pair of stolen shorts. England is still a divided society. We glimpsed it for an instant – like a small nightmare breaking into an expansive, comfortable dream – during the intermission in a performance of A Midsummer Night’s Dream. This entry was posted in Cotswold Way by George Quinn. Bookmark the permalink. The landlady was released after an appeal. What a pity you couldn’t fit the Shakespeare bust into your back-packs! Shakespeare busts are available in all sizes. I suppose I could have bought the key-ring with a tiny bust of Shakespeare on it, but I thought it might be a bit disrespectful. Hmmm, I don’t know why I suffered this attack of deferential respect given that I bought some Shakespeare gingerbread and had no scruples about eating it (it was nice!). I was also very tempted to buy the Shakespeare stuffed doll that can be used as a pin-cushion (on sale in the Globe Theatre gift shop in London), but in the end I didn’t.